K.C. Wheare defines federal government as an association of states, which has been formed for certain common purposes, but in which the member states retain a large measure of their original independence. A federal government exists when the powers of the government for a community are divided substantially according to a principle that there is a single independent authority for the whole area in respect of some matters and there are independent regional authorities for other matters, each set of authorities being co-ordinate to and subordinate to the others within its own sphere. The framers of the Indian Constitution attempted to avoid the difficulties faced by the federal Constitutions of U.S.A, Canada and Australia and incorporate certain unique features in the working of the Indian Constitution. Thus, our Constitution contains certain novel provisions suited to the Indian conditions. The doubt which emerges about the federal nature of the Indian Constitution is the powers of intervention in the affairs of the states given to the Central Government by the Constitution According to Wheare, in practice the Constitution of India is quasi-federal in nature and not strictly federal. Sir Ivor Jennings was of the view that India has a federation with a strong centralizing policy. In the words of D.D. Basu the Constitution of India is neither purely federal nor unitary, but is a combination of both. It is a union or a composite of a novel type. The Indian Constitution is not only regarded as Federal or Unitary in the strict sense of the terms. It is often defined to be quasi-federal in nature also. Throughout the Constitution, emphasis is laid on the fact that India is a single united nation. 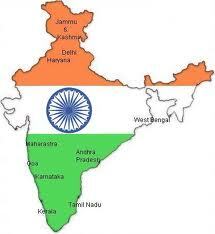 India is described as a Union of States and is constituted into a sovereign, secular, socialist, democratic republic. Constitution of India stipulates that India will be a Union of States (Art.1). Thus the existence of federal structure of governance for this Union of States becomes a basic structure of the Union of India. Dr. B.R. Ambedkar, the principal architect of the Constitution observed-........ the use of the word Union is deliberate. The Drafting Committee wanted to make it clear that though India was to be a federation, the federation was not a result of an agreement by the States to join in the federation and that the federation not being the result of an agreement no state has a right to secede from it. Though the country and the people may be divided into different states for convenience of administration the whole country is one integral whole, its people a single people living under a single imperium derived from a single source. In the case of Keshavananda Bharti v. State of Kerala, some of the judges in the full Constitutional Bench expressed federalism as one of the basic features of the Indian Constitution. In Sat Pal v. State of Punjab, the Supreme Court again held that ours is a Constitution where there is a combination of federal structure with unitary features. US Constitution has dual citizenship, dual constitution, an independent though non-singular judiciary and equal representation of states in US Congress, while India has single constitution, judiciary, citizenship, and unequal representation of states in Rajya Sabha. Procedure to amend Constitution is simpler in India than US (2/3th states ratification). Indian states are destructible, while USA has indestructible states.